No team in history besides the Boston Celtics have made it to the NBA Finals five times in a row. The Golden State Warriors can change that this season. But not before they get past three teams from the Western Conference first. Houston Rockets could be among those three teams. The franchise came agonisingly close last time, before the Warriors prevailed in seven games. This season, should the Rockets make it to the NBA Finals, it will be the first time point guard Chris Paul and coach Mike D’Antoni experience the Finals. Matchup History: Golden State and LA are meeting in the Playoffs for the second time. 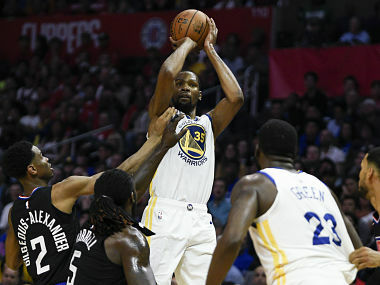 The Clippers defeated the Warriors in the 2014 first round in seven games — the last Western Conference team to beat Golden State. No players who played for LA in that series are still with the team. Study in Contrasts: The Warriors are the first team in 43 years to play five All-Stars from the previous season at the same time. Meanwhile, the Clippers are the fourth team in NBA history to win more than 45 games without a current or former All-Star on the roster. Three-Point King: Stephen Curry (378) needs to make eight three-pointers to pass Ray Allen (385) for the most in Playoff history. The two-time MVP has credited the use of contact lenses for helping him snap out of a post-All-Star shooting slump. DeMarcus Debut: Golden State’s DeMarcus Cousins will play in the postseason for the first time in his nine-year career. As of now, no active player has played more regular-season games without a Playoff appearance than Cousins (565). Super Subs: Golden State’s Andre Iguodala and LA’s Lou Williams were teammates for seven seasons with the 76ers. Both have flourished in the latter stages of their careers, Iguodala as a jack-of-all trades Finals MVP during the Warriors’ three championship runs and Williams as a two-time NBA Sixth Man Award winner and the league’s career leader in bench scoring. Sharp Logo: Jerry West’s fingerprints are all over this series. In six-plus seasons as a consultant with the Warriors, his input helped Golden State assemble a championship team. Since joining the Clippers in 2017, West has played a key role in shaping the team’s future. The Doc Is in: Clippers coach Doc Rivers has been candid about the end of the Chris Paul-Blake Griffin era in Los Angeles and how it tested his love for coaching. Over the last two seasons, he has rediscovered the joy with a close-knit group of overachievers, similar to the first team he coached in Orlando back in 1999-00. Shai Kid: Rookie point guards rarely start for Playoff teams, but LA’s Shai Gilgeous-Alexander is defying conventions with his polished game. The 20-year-old Canadian is playing his best basketball of the season. His first Playoff assignment: go head-to-head with Stephen Curry. Plenty in Reserve: Clippers teammates Lou Williams and Montrezl Harrell — both acquired from Houston in the Chris Paul trade — are top Sixth Man Award candidates and the highest-scoring reserve duo in NBA history. The two have also formed a strong bond off the court. Livingston’s Last Call? Golden State’s Shaun Livingston began his career with the Clippers as the No 4 pick in the 2004 NBA Draft. Injuries kept the potential preps-to-pros phenom from reaching his full potential, but he has battled back to carve out a fantastic career. At age 33, he has talked about the possibility of retiring soon. Matchup History: This is the seventh Playoff meeting between the Nuggets and Spurs. San Antonio lead 5-1, most recently defeating Denver in the 2007 first round en route to the franchise’s fourth NBA title. Winning Tradition: The Spurs are making their record-tying 22nd straight Playoff appearance after their record 22nd consecutive winning season. San Antonio has reached the postseason in 39 of 43 seasons since joining the NBA in 1976. Riding High: Denver is ahead of schedule thanks in large part to the work of its front office, led by VP of Basketball Operations Tim Connelly. Under his direction, the Nuggets have drafted MVP candidate Nikola Jokic in the second round in 2014; added budding stars Jamal Murray and Gary Harris through the draft; acquired Will Barton and Mason Plumlee in trades; and signed four-time All-Star Paul Millsap in free agency. Better Days: LaMarcus Aldridge got off to a rocky start in San Antonio, with both sides questioning the fit. 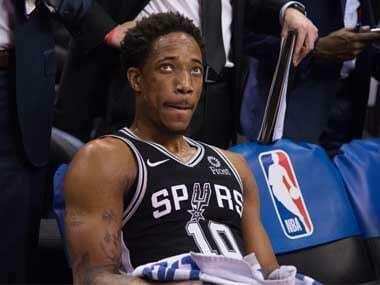 After a conversation with Gregg Popovich in the summer of 2017, Aldridge has been a stabilising force for a team that has experienced significant roster turnover. Aldridge earned his seventh All-Star nod this season. Silver Anniversary: This marks the 25th anniversary of the Nuggets making history as the first No 8 seed to defeat a No 1 seed. In the 1994 Playoffs, Denver upset Seattle in a five-game, first-round series. 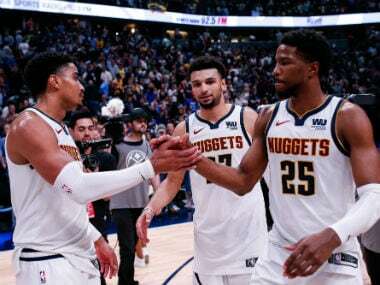 Since then, the Nuggets have won only two Playoff series – both in 2009, when they reached the Western Conference Finals. Homecoming: San Antonio’s Derrick White grew up near Denver and attended the University of Colorado-Colorado Springs and the University of Colorado. At this time last year, White was leading the Austin Spurs to the NBA G League title. Now, he is a San Antonio starter and a promising part of its future. Unlikely Pair: Derrick White and backcourt mate Bryn Forbes have both come up the hard way. Forbes was a two-star high school recruit who spent his first two collegiate seasons at Cleveland State before transferring to Michigan State. Despite going undrafted in 2016, Forbes has steadily developed into a quality NBA starter. Pop Milestone: San Antonio coach Gregg Popovich (167) needs five victories to pass Pat Riley (171) for second place on the all-time postseason coaching wins list, behind Phil Jackson (229). If the Spurs win this series, Popovich would tie Riley entering the Western Conference Semi-Finals. Shared Roots: Denver and San Antonio are two of the four teams who joined the NBA in 1976 after the dissolution of the American Basketball Association. Matchup History: The Trail Blazers and Thunder are meeting in the Playoffs for the fifth time overall, the first time in 28 years and the first time since the latter’s move from Seattle to Oklahoma City. Each franchise has won two series. Point Break: The rivalry between All-Star point guards Damian Lillard of Portland and Russell Westbrook of Oklahoma City is old school. They don’t speak or shake hands before games. They go at each other hard, but still leave the court with a healthy amount of respect, if not affection, for one another. By George: Paul George validated his decision to re-sign with the Thunder by turning in a career season that might place him in the top three of the voting for MVP and Defensive Player of the Year. George is a proven Playoff performer, dating to his days going head-to-head with LeBron James in the Eastern Conference. For Starters: Terry Stotts’ first NBA job was as an assistant under George Karl with Seattle from 1994-98. He was part of the staff that led the SuperSonics to the 1996 NBA Finals against the Bulls. Stotts, one of the game’s most underrated coaches, has Portland in the playoffs for the sixth consecutive season. Old Friends: Portland’s Enes Kanter (Turkey) has singled out his two seasons playing for the Thunder as the most fun he has had in the NBA. He was the team’s sixth man and grew close with Westbrook and Steven Adams (New Zealand), last year calling them his two best teammates. Kanter, replacing injured starter Jusuf Nurkic (Bosnia and Herzegovina), will now match up vs. Adams. Draft Gems: OKC’s Steven Adams (12th) and Dennis Schröder (17th, from Germany) and Portland’s CJ McCollum (10th) have outperformed many of the players selected ahead of them in the 2013 NBA Draft. Hood Winked: The Thunder passed on selecting Rodney Hood with the 21st pick in the 2014 NBA Draft, opting for Mitch McGary, who last appeared in an NBA game in 2016. Hood, who went 23rd to Utah, has had his ups and downs in the NBA, but he has given Portland some much-needed shooting off the bench since being acquired from Cleveland in February. Family Affair: OKC’s Jerami Grant was born in Portland in 1994, when his father, Harvey, was playing for the Blazers. The elder Grant played 11 NBA seasons. Jerami’s brother Jerian is in the playoffs with Orlando. Matchup History: Houston and Utah met last year in the second round, with the Rockets winning in five games. This is their ninth Playoff meeting. Their rivalry took off in the 1990s, when the teams split four series and the winner made the NBA Finals each time. Hot Stuff: Both teams are hot. Houston posted an NBA-best 20-5 record since the All-Star break – two games ahead of Utah (18-7). The Rockets went 42-15 after an 11-14 start. The Jazz went 30-11 after a 20-21 start. 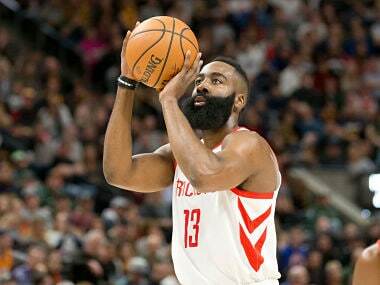 Challenging Harden: Utah’s No 2-ranked defence, anchored by reigning Defensive Player of the Year Rudy Gobert, will try to slow down scoring champion James Harden. Donovan Mitchell vs Harden is a fun matchup. Fast Friends: Utah budding star Donovan Mitchell has developed a close relationship with Houston star Chris Paul. It was Paul (along with Paul George) who encouraged Mitchell to enter the 2017 NBA Draft instead of returning to Louisville for a third season. Mitchell has worked out with Paul in the offseason. Centres of Attention: Utah’s Rudy Gobert (France) and Houston’s Clint Capela (Switzerland) were both late first-round draft picks who came to the NBA from the French League, took a few years to get established (including NBA G League stints for each player) and are now standouts. Capela, 24, two years younger, views Gobert as a role model and loves playing against him. The two faced each other a few times in France. What If … If things had played out a bit differently, Joe Ingles (Australia) and Chris Paul could have been teammates — perhaps for years — with the Clippers. In 2014, Ingles was the Clippers’ last preseason cut as LA decided to keep another guard (Jared Cunningham) for its Paul-led backcourt. Utah immediately signed Ingles, who has blossomed into a solid NBA starter and fan favourite. Front-Office Link: Jazz GM Dennis Lindsey spent 11 seasons with the Rockets as a front-office executive, video coordinator and scout. In 2007, Lindsey hoped to get Houston’s GM job, but it went to Daryl Morey instead. Lindsey then left Houston for San Antonio to essentially replace Spurs assistant GM Sam Presti, who had been hired as the Seattle (now Oklahoma City) GM. Lindsey and Morey are both well-regarded GMs. Swiss Connection: Houston’s Clint Capela and Utah’s Thabo Sefolosha are the only Swiss players in NBA history. Sefolosha was the first, and the younger Capela tracked his success in the newspaper back home. Capela says that, by design, he signed with the same French team that Sefolosha played for (Elan Chalon). Brazil Connection: Utah’s Raul Neto and Houston’s Nene are Brazil natives who played for the National Team at the 2016 Summer Olympics. No 4 vs No 5: The No 5 seed has defeated the No 4 seed in a West first-round series in each of the last seven years.